Summer is creeping up again, that glorious time of vacation, tanning or sunscreen (if you’re a redhead like myself) and of course, festivals. For small businesses, festivals provide a huge opportunity to reach new customers. All you need is a booth, some swag and a smile. Where is the action? Where is the food? That is where the people will be and that is where you should center your booth. If you cannot control your booth location, figure out how to bring people to you. Are you surrounded by other businesses? Are you far from the main action? Consider forming a “street team” to hand out free stickers or flyers alerting festival-goers of where you are and what you do. This is an excellent way to spread the word about what you do and at least to get your name out, just make sure that they are as enthusiastic about your brand as you are. At music festivals, people hand me free ice water, sunglasses or sometimes sell cheap hats and sunscreen. These essential items for sun protection double as a wonderful way to build brand awareness. If you aren’t getting a lot of foot traffic to your booth, send a street team out to inform the crowd that your booth is handing out free sunglasses. Bring people to your products. Along with giveaways and picking a prime location, you need to stand out from all the other businesses there. 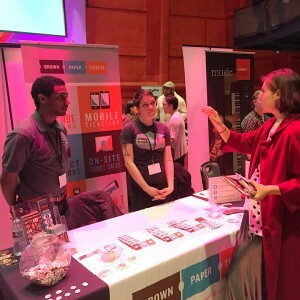 Give the crowd an experience that makes them curious to know more about your business. Obviously, unique products help. Going to Warped Tour, I found the tents selling Rasta hats memorable, although I had no desire to buy one. Bigger tents stole my attention too, because they took up so much space. Then again, they would be nothing without unique products. Visuals are important and if appropriate, lights and physical displays or entertainment, like dancing, will attract festival-goers. From personal experience and preference, I would stay away from black and gray. Stick out with bright colors. Make your display pleasing to the eye to grab attention among all the competitors around you. Lights and decorations, as mentioned above, offer other opportunities to stand out. Do not expect people to come back if you’re not providing them with something of value. Steps one through four are meant to get some foot traffic to your booth, but the quality of your product is what will keep them around for refreshments. All of the above will help, but to make your festival experience a success and get invited back next year, you need to be a quality company with meaningful products and excellent service. Our guest poster Robert Lanterman is a writer and musician out of Boise, ID. When he’s not doing either of those things, he’s probably eating pizza, watching Netflix or attempting to run a record label out of his bedroom. Tags: small business, trade shows.